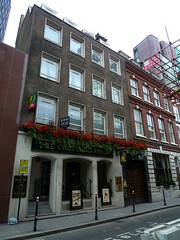 It used to be a Nicholson's pub, but according to the April/May 2011 edition of London Drinker, it was acquired by the Stonegate Pub Company in October 2010. According to the 2011 Good Beer Guide, it has a patio garden. Last edited 2013-05-10 07:02:04 (version 6; diff). List all versions. Page last edited 2013-05-10 07:02:04 (version 6).